I like the pointy ones... but I also like the smallest chubby ones. I think they would be cute on a tiny quilt. 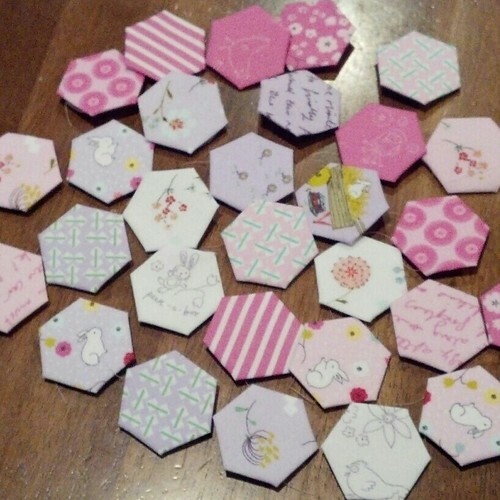 Each one is made of just 13 hexagons. 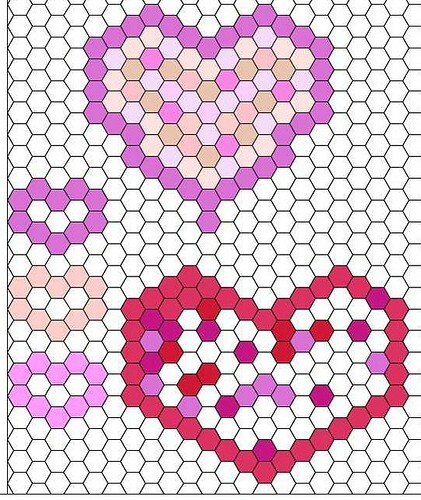 Let me know if you decide to make a hexagon heart! I have finished 6 more blocks that aren't shown here, too. 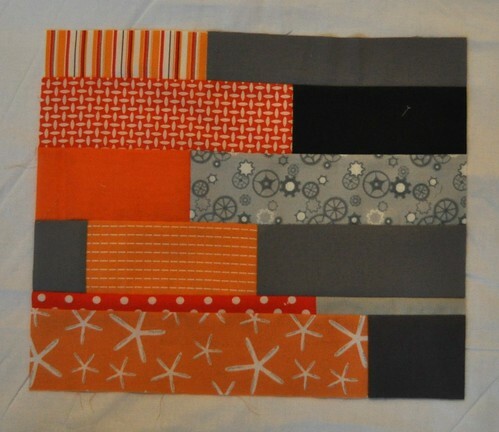 I have been crowdsourcing advice on the color scheme for this quilt, trying to decide if I should add pink or not. I made up a block with some blush colored Mendocino octopi fabric, it's sort of peachy pink but has a dark orange octopus in it. So that color is in. I think. I'll have to lay the whole group out again next time it is light and we are home, and see how it looks. We are excited for our 2nd annual Christmas Eve in Seattle traditions tomorrow; planning on visiting a fun beach and going to a very delicious restaurant too. I'm excited for Christmas and also happy for the solstice and the return of lighter days. Our group took the month of December off; I'm looking forward to next month! Hi everyone! 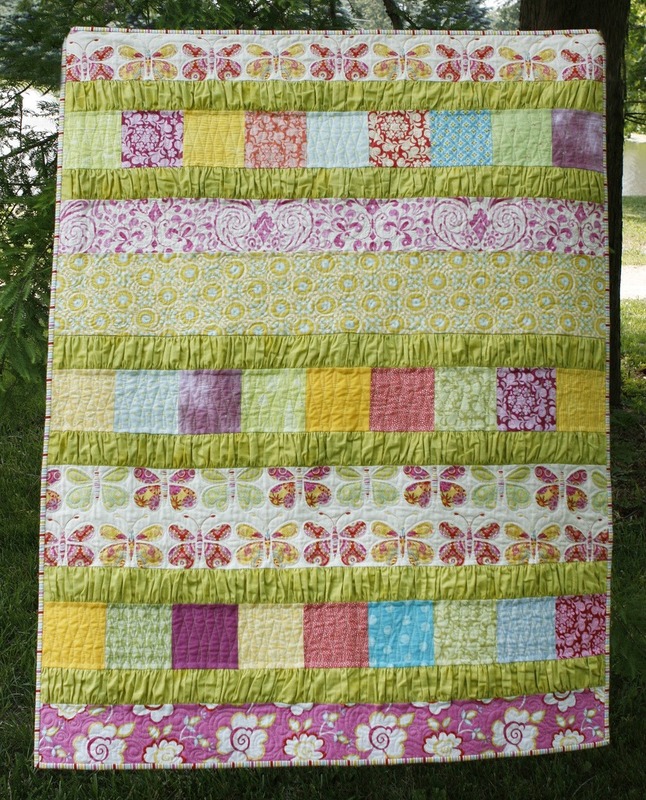 The winner of one of my patterns for the Sew, Mama, Sew giveaway was commenter number 81, Allison from Dreaming in Patchwork. I've emailed her to confirm her pattern choice and will send her the pattern she chooses as soon as I hear back! 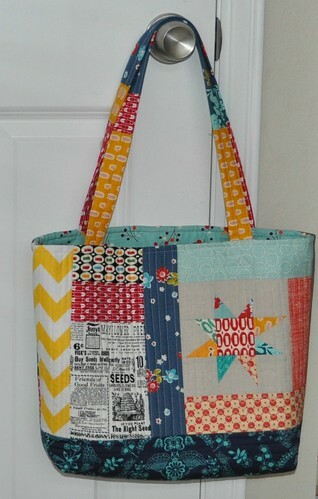 I also wanted to show off my new quilt-as-you-go tote bag. It was very gray here today so the pictures are kind of dark. 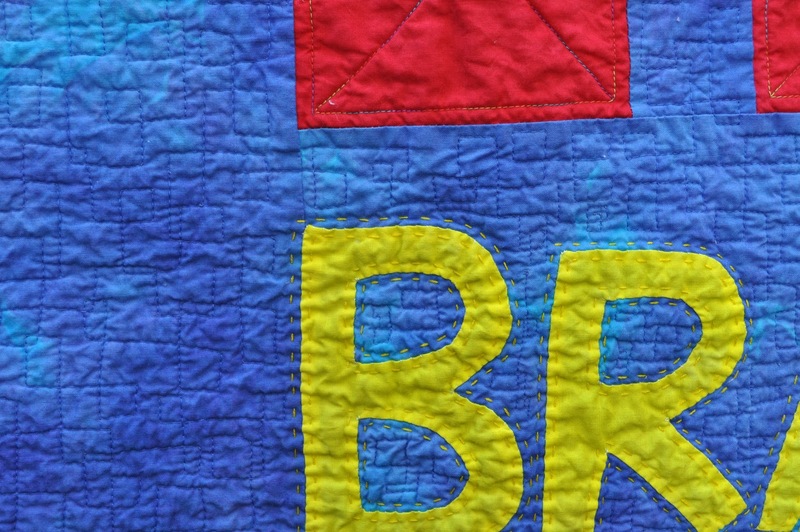 I made it using the quilt-as-you-go process described on Elizabeth's blog. 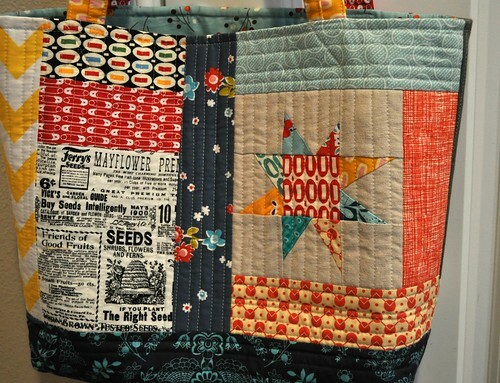 I used white thread for the quilting on the upper part of both sides of the bag, and navy blue thread on the dark bottom section. I made a simple pocket with room for my phone and a few pens. 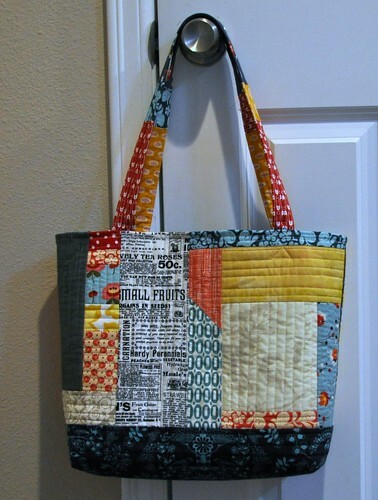 Overall I am pretty happy with the bag but there are a few things I'd change if/when I make one again. The handles... I'm still not sure I like them all colorful and think they might be better made from one fabric. Also I think the bag would be better with the handles attached slightly closer to the center of the bag. At least the handles are both the same length and it's a good length. The lining isn't quite the perfect fit either, it's a bit too big, but I guess that's better than too small. 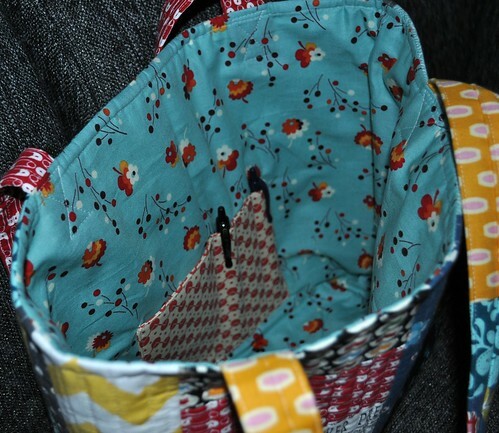 I think next time I make a bag I'll cut the lining out to match the exterior pieces before assembling the interior. The bag measures about 13" high and 16" wide (with my church binder and books inside) and it's just the size I wanted. On to last minute Christmas sewing! 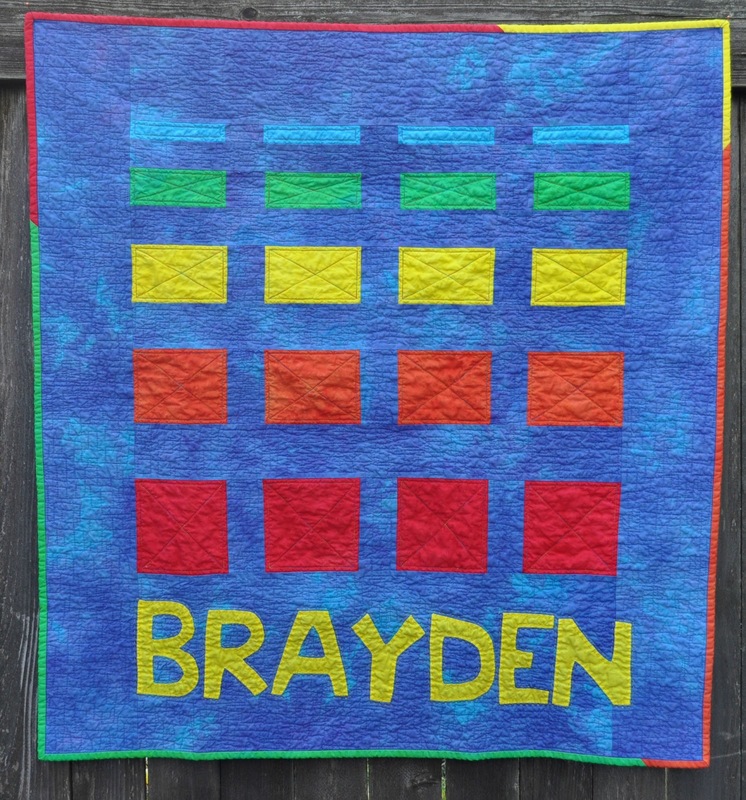 Recently a group of blogging friends and I finished up a group baby quilt for Natalia's baby boy. 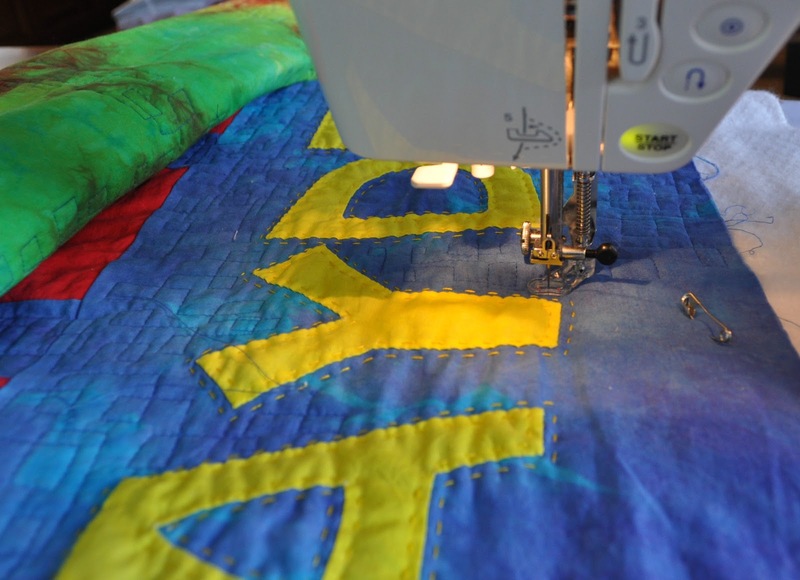 She was given the quilt last week, which means it's time to blog about the group project now! 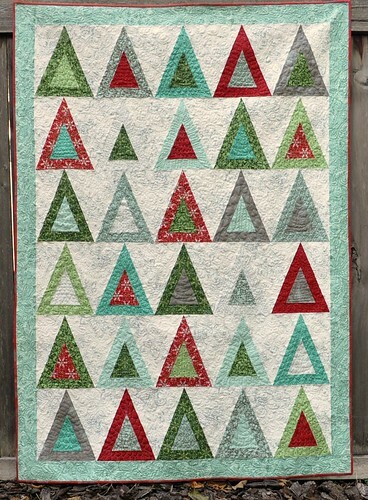 We used a design by Amy E (Amy's Creative Side), who adapted a pattern from her book, Modern Basics, to make it baby quilt size. 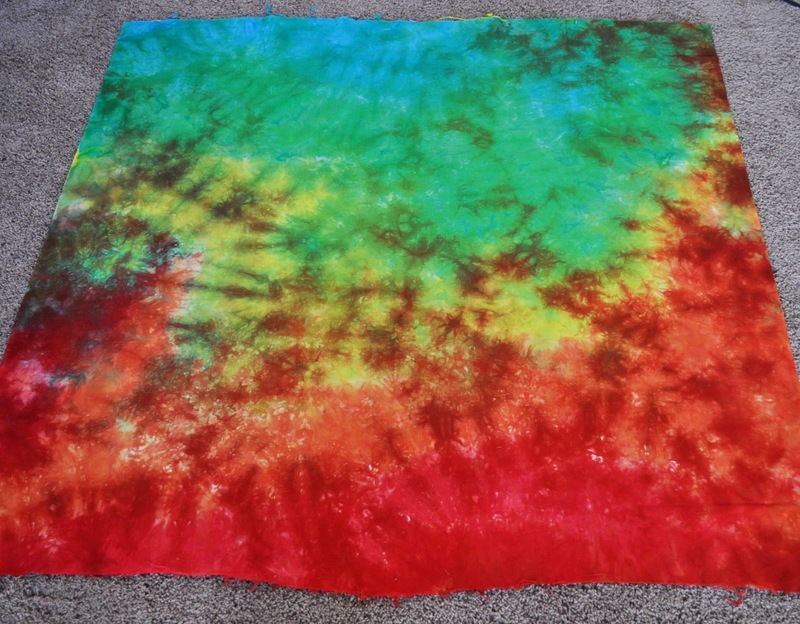 Candy, of Candied Fabrics, dyed the beautiful fabric for the quilt. Amy E and Amylouwho completed the quilt top. Rita from Mochi Studios beautifully hand appliqued the baby's name. And when it got to me it was time for quilting. First off I had to press the quilt back and top. Isn't this fabric amazing? This is the back of the quilt. I love it. I love how the colors pop against the blue background. 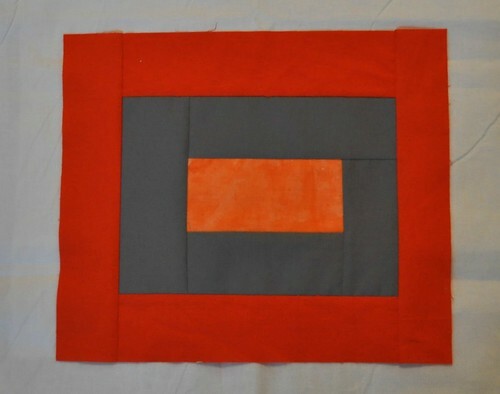 I decided to quilt a squared-off pattern that would be called "loopy" if it was done without the square corners. 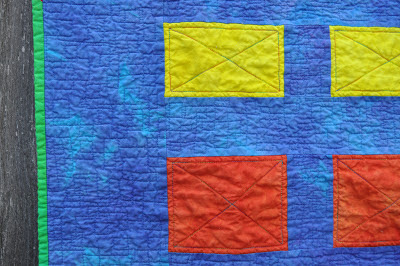 It was a new quilting design to me and it went pretty well, but it can be a challenge to quilt square corners when you're used to quilting curves. 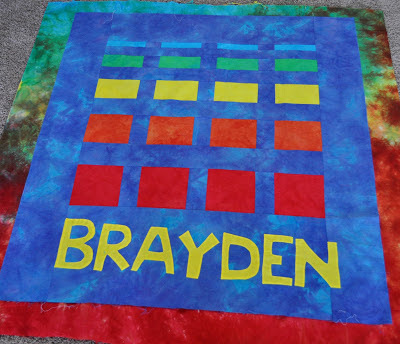 In the colored rectangles, I quilted outlines and X's, using my walking foot. This photo, and the rest of the photos were taken after the quilt was washed and had shrunk up a bit. 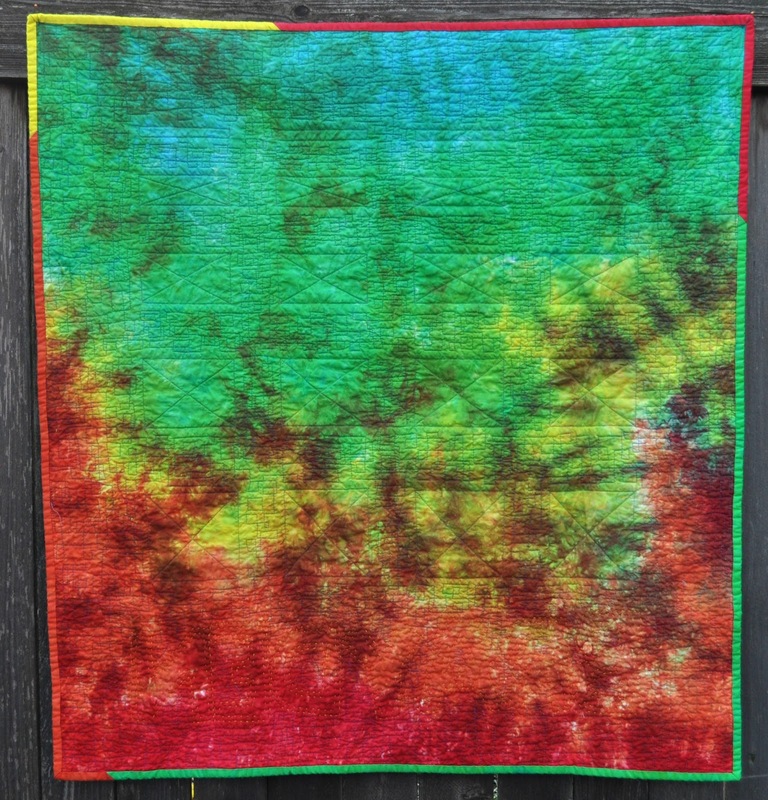 I like how the square loops turned out but next time I do them I will try out a larger scale. Also, I hand quilted around the letters using 2 strands of embroidery floss. After the quilting was done, I bound the quilt using 4 of the fabrics from the colored rectangles (there wasn't enough turquoise, but it turned out fine without it.) Here's the finished project! It was fun to plan out this group project and to have it turn out so well! 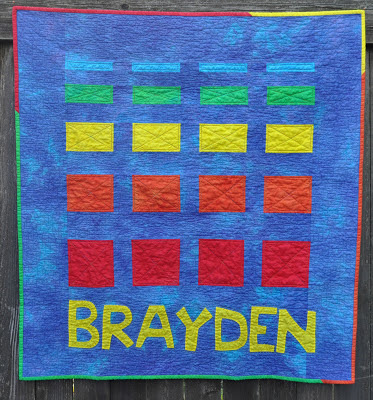 You can see the adorable baby with his quilt here! Happy giveaway day! I'm going to keep this short and sweet since I know you want to visit all the excellent giveaways linked up over at Sew, Mama, Sew! 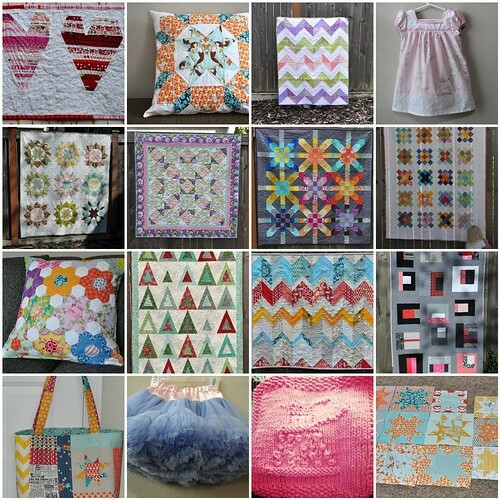 If you want more information about the patterns you can check them out at my Craftsy pattern store. Also, if you are new to my blog, I just want to encourage you to bookmark/pin my blog and come back and check out my tutorials. 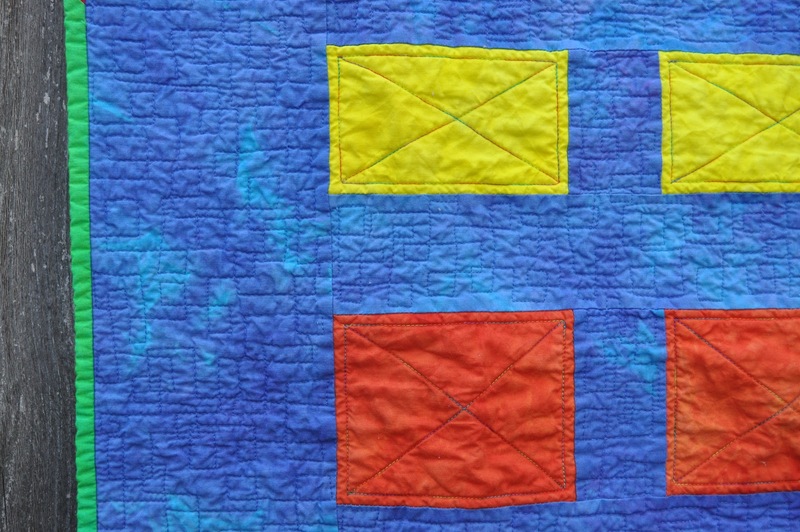 I have a few clothing construction tutorials and quilting tutorials including how to baste, free-motion quilt, and bind your quilt. Giveaway will be open until December 7 at 5 p.m. PST. I will post the winner by December 9 and will email the pattern to the winner that day as well. If you are a no-reply blogger, please make sure your email address is included in your comment so I can reach you if you win.